And so the time has come for me to serve the members of the AMTA-MA Chapter in a different way. In May my term as President ends, and I'm excited to step into the role of Immediate Past President and watch my colleagues take the reins. This is my final president’s letter to you. Some days it certainly seems like 4 years have flown by. Other days, not so much! As I thought about what I was going to write to you in this last letter I found myself reflecting on my very first letter to you as president. I was on a flight home from Seattle, WA after representing the Mass Chapter at the International Research Conference hosted by the Massage Therapy Foundation. I was in awe at all the material presented and felt so proud that the AMTA-MA Chapter was (and continues to be) a proud sponsor of the MTF. Little did I know that our state would play host to the 2013 International Research Conference in Boston and that one of our members would run Boston Marathon 2014 in the charitable bib program with both MTF and AMTA on their running jersey. For more information on AMTA-MA member Kristen Lutz and her journey from Hopkinton to Boston and how you can support her click here. Twenty-three years ago when I graduated from massage therapy school there was so little research information available to us - That is no longer the case. I am so appreciative of the MTF and all they have done for the massage therapy profession. Their mission to advance the knowledge and practice of massage therapy by supporting scientific research, education, and community service inspires me, and it has been my privilege to work with them so closely this past 4 years. I have so many people to thank for all they have done for our chapter and who have worked closely with me during my presidency. Our lobbyist firm of Lynch associates is working very hard on your behalf right now to get a bill passed that in part will give the Department of Public Licensure jurisdiction over online advertising, essentially shutting down elicit behavior that markets itself exclusively via the internet. Thank you Anne, Mark and Kim for all you do for the AMTA-MA Chapter members. Four years ago we signed a contract with attorney Scott Dunlap to retain his services for our members. It proved to be a great decision. Scott and his firm have taken on towns and insurance companies on behalf of AMTA-MA Chapter and won. They’re helping to bring the professionalism of massage therapy to the forefront and show that we will be heard. You have affordable health insurance options thanks to our partnership with the Massachusetts Business Association. This has never been more important than now as the Affordable Care Act becomes a household conversation. To read more on this important topic click here. Thanks to Allissa Haines, our online marketing manager. Communication with our members via our social media avenues, website, and email has never been better. We do our best to keep you up to date with legislative issues, research news along with everyday articles that can be used in your massage therapy practice. While there has been a change in policy from national AMTA whereby our members now pay their chapter fee directly to the AMTA-MA Chapter, I wish to assure you that we’ve never been stronger and worked harder for our members. You have a very hard working group of volunteers who steer the chapter for you, putting on events and working every day to build on your benefits. It has been my honor to work with the most dedicated group of volunteers I have ever met; You all know who you are and I thank you for all you have done to make my 4 years as president such a memorable one. Finally I wish to thank you, the member. I have heard from so many of you over the years and without you there would be no AMTA-MA Chapter. I thank you for the privilege to serve you and what a privilege it has been! The Annual Meeting weekend of May 3 and 4 promises to be an exciting one with great education from Laura Allen, fabulous vendors, elections, awards and door prizes. I hope you can join me that weekend as I say goodbye in my last presentation as president of the AMTA-MA Chapter. 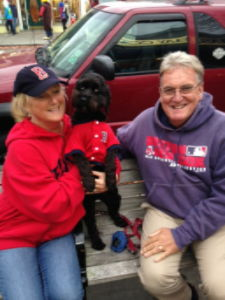 After that, it is on to sailing season for me and time with my husband Chris and puppy dog Molly. Chris has been so supportive over the last few years with all my weekends away from home, being my IT guy and simply just being my rock. I would not have been half the president I was if I did not have his support. And Molly? Well she just adds the cuteness factor.